"I need each bar in a bar chart to be a different color. How do I do this?" By default RadChart is designed so that all bars from a series have the same colors. If you need each to have a different color, loop through each chart series item and assign them a color from an array. This should be done after binding the chart, so the chart series items are available. 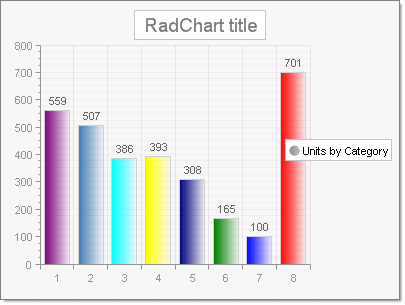 RadChart1.Series(0).Name = "Units by Category"